So, how big can you ship? How big do you need? What is the cost of shipping? These and the related questions are ones that design teams and project managers must wrestle with every time they need a PDC building. Most of these are going to be shipped, by truck, for some, or the entire portion of the site where the power distribution is needed. We won’t get into all of the shipping requirements here, that’s for another time and an expert on the subject. Here, we’ll discuss a couple of brief guidelines regarding PDC buildings when they get “Oversized”. 1. It is better to add to the length of a building than to the width. This might seem obvious, but here’s why. It is much easier mechanically to have a building split in the horizontal axis of the building than the axis running along the longitude. The design of the split is fairly straightforward and allows for very safe and quick attachment of the two halves in the field. Gear, cable trays, conduit, etc. can all be designed to allow for the split. The engineering required for this type of split is less expensive, and the amount of mechanical connections required to combine the two halves is less. With a split along the longitudinal axis, there are more considerations with respect to mechanical design, additional connections to be made, and the “sealing” of the building is more involved. Most often, there are door openings, at one or both ends of the building, which means the door and transom must be installed and sealed correctly in the field. This is more time consuming and often results in leaks in and around the door assemblies. With a horizontal split all of these issues can be planned for and alleviated to a large degree, so if there is an option, go longer and not wider. 2. Shipping long pieces are less expensive than shipping wide pieces. The cost and logistics associated with shipping very wide loads (>16’-0”) make it more cost effective to add to length to a shipment rather than width. Over wide loads often have to shut down entire routes for the load to physically pass through the area, whereas long loads may delay transportation, they don’t often call for the outright closing of thoroughfares in order for the load to physically clear in a safe manner. Additionally, wide loads call for more escorts, often including local law enforcement assistance, and the cost of this goes up significantly. There are also more prohibitive travel times with the wide loads, increasing the length of time to reach the destination, and therefore also the cost. 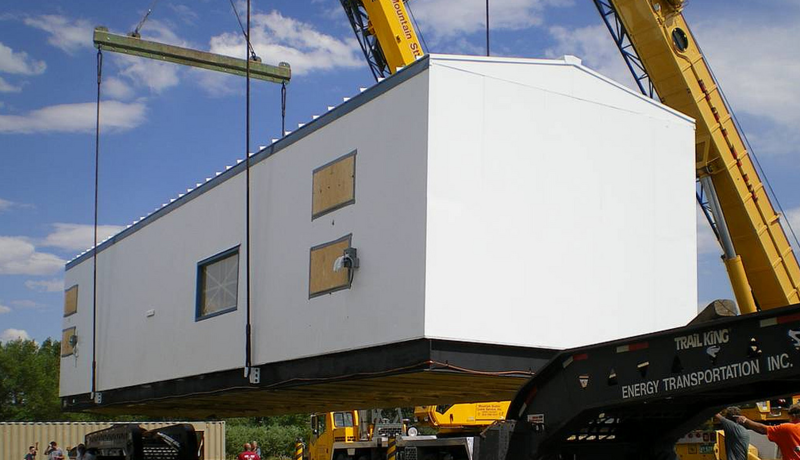 In cases where a very wide (20-30’ wide) building is necessary for the gear and equipment to be accommodated correctly, it is still better to split along the longitudinal axis for shipping and handling purposes. While not as optimum as the horizontal split, there are still cost savings with respect to shipping the unit to the final destination. In many states, any load that exceeds 16 or 17 feet puts the freight into the “Super Load” category, which greatly increases the cost and limits the time of travel, eating into both project budgets and lead times. We take pride in our work. We are at our best when we are engaged in the process from engineering to final delivery. Our teams of experts are available to lend their experience to your project. If you are designing large PDC buildings and need some input, please call us. Easter-Owens has been in business for over 60 years, and we look forward to helping with your project.